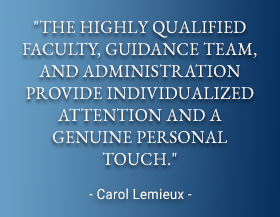 Campus Ministry is a critical component of the Catholic mission at East Catholic High School. In recent years, Campus Ministry has evolved into a comprehensive pastoral program that includes retreats, spiritual formation, service outreach, liturgy, prayer, freshman support groups, bereavement, peer ministry, and spiritual formation of faculty and staff. "Love all, serve all" is the theme of the Campus Ministry team. Led by two lay ministers, the Campus Ministry program is a thriving example of faith in action at East Catholic High School. The Church's social teaching is a compilation of wisdom aimed at building a more just society and living lives of holiness amid the challenges of modern society. Modern Catholic social teaching has been articulated through tradition and a compilation of Church documents. The depth and richness of this tradition requires thoughtful study and is a critical core component of the East Catholic curriculum. Kairos is a Catholic retreat program generally held at either Holy Family Retreat Center in West Hartford, Connecticut, or at Our Lady of Calvary Retreat Center in Farmington, Connecticut. This program is grounded in Christian incarnational theology, which is our belief that God continues to be with us in our daily experience through the presence of Jesus Christ manifested to us in word, sacrament, and community. Kairos is an intense, four day experience of Christian community where prayer, peer reflection, liturgy, sacraments, and faith-sharing are the norm. The retreat is not meant to build exclusive groups but rather to lay the groundwork for continuing Christian formation and community, which is why the follow-up to the retreat is critically important. The program is a beginning and a deepening, not an end in itself. Please direct your questions about East Catholic Kairos to our Campus Ministry Department. Peer Ministers are living examples of Christ in the world. They demonstrate a spirit of service among their fellow students and the larger school community by their willingness to be involved and by giving their time and their hearts in gestures of charity. Peer Ministers are leaders among the student body. They accept responsibility to generate ideas for the spiritual well-being of the school and then bring those ideas to fruition. The celebration of the Eucharist and daily prayer are central to the faith life of East Catholic. 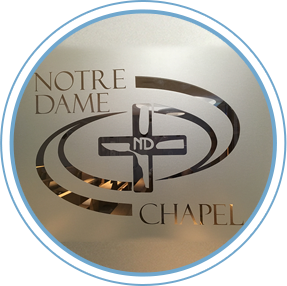 We offer Mass in the Notre Dame chapel every week on Thursday mornings. In addition, all members of the school community gather monthly to celebrate Mass together. Each day and every class period begins with prayer. The long-observed tradition of third period prayer is a special part of the East Catholic experience. At the start of third period each day, activity ceases as the entire community pauses to offer special intentions and prayers to our loving God or to reflect on a special theme or reading. Third period prayer is led by students and faculty members. The time serves to unite and ground the school community. Student peer ministers coordinate liturgies in conjunction with campus ministers. We encourage students to read, serve, and participate as music ministers and ushers at all school liturgies. Kairos retreats begin on Tuesday evenings with a bus departure from East Catholic at 6:30 p.m. and end on Friday with the bus arrival at East Catholic at 6:00 p.m. The cost per student is $200 (which includes a $35 per student subsidy from the ECHS Parents Association). Scholarships are available. Peer ministers meet the first Wednesday of every month at 2:00 p.m.